Walking across the fields behind my house this summer I came across new signs posted up next to some of the stiles. They warned dog owners that their dogs could be infected with a parasite that represented a serious threat to pregnant cows. The parasite was Neospora. The parasite, Neospora caninum, was only recognised in the 1980s. Before this, it had been misdiagnosed because it looks like a related single-celled parasite, Toxoplasma gondii. A major difference between the two being the ability of Neospora infections to cause abortions in infected cattle. Neospora is a dog parasite that infects a variety of mammals, including cattle, in its asexual stages. Dogs are the definitive hosts (the host in which the parasite reproduces sexually) of Neospora. They become infected after eating infected animals; rural and wild dogs being most susceptible due to their scavenging habits. In the USA, coyotes have also been found to transmit Neospora and it is possible that other wild carnivores such as foxes do so too. 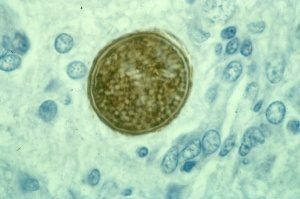 This single-celled parasite invades the dog’s tissues, dividing rapidly and causing cells to die. If the dog is pregnant the parasite can pass across the placental barrier into the foetus causing puppies to be born dead or with nerve damage. Infection leads to the disease canine neosporosis. In puppies this is seen as stiffness in the back legs leading to paralysis. In older dogs the nervous system is usually involved. Seizures, blindness and behavioural changes can occur and eventually muscle paralysis can affect respiration, leading to death. Although 5% of dogs worldwide test positive for antibodies to Neospora, the disease is relatively rare. In the gut tissue, the parasite produces cysts which are shed in the faeces of infected dogs and will contaminate pasture or surrounding water if dogs defecated and their faeces are not removed. These cysts can lay dormant for weeks. Cows become infected if they ingest Neospora cysts. Although cattle do not produce cysts, and cannot therefore infect other members of the herd in this way, once infected they remain infected for life. They appear to have no disease symptoms but can pass infection onto their offspring in the womb during every subsequent pregnancy. Initially, when a cow becomes infected with Neospora the parasite multiplies rapidly in the tissues, the immune system will then come into play, limiting the spread of infection. The parasite changes to a slowly replicating form that hides in cells, usually in the brain. However, if a cow becomes pregnant her immune system is altered and is not so effective against the parasite. Neospora then escapes from the cells it has been hiding in, travels in the blood to the placenta and begins to replicate in here and then in the cells of the developing foetus. In these cases, the foetus is not always aborted but, if the calf survives and is a heifer, she can transmit the infection to her calves, causing abortions during its successive pregnancies. The situation is different if a cow is first infected when she is already pregnant. Cattle infected early in pregnancy are likely to abort the foetus whilst, if they are infected later, live calves may be born carrying the infection. Older cows are less likely to abort but, again, will maintain the infection in the herd by passing it on to their calves. In many countries, Neospora is considered to be the major cause of abortions in cattle, with over 90% of cattle infected in some herds. A study in 1999 found 12.5% of abortions in cattle in England and Wales may be attributed to Neospora infection and cattle positive for antibodies to Neospora were 3.5 times more likely to abort than those that were negative. Today Neospora is considered to be becoming an increasing threat to cattle. Infections can be diagnosed by detecting antibodies in milk samples. A study conducted in the South of England in 2012 concluded that, over 42% of milk tankers sampled were positive. More statistics are available in a farmers guide to Neospora. There is no recognised cure for Neospora infection, nor has a vaccine yet been developed, but researchers at the Moredun Institute are working towards that goal. They have produced an excellent video explaining the danger that is posed by dogs defaecating where cattle roam. In addition to pets, farm dogs can be responsible for spreading Neospora through a herd that is already infected. The chance to scavenge offal should be removed, especially round calving sheds where afterbirth, potentially from infected cows, could be eaten by dogs. 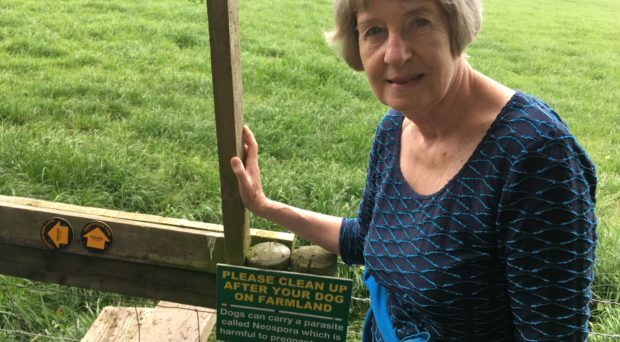 Most dog owners, at least in the UK, diligently remove their dog’s poo from pavements, and paths in towns, villages and parks, however, in rural areas, especially when crossing fields or walking country lanes, many consider this to be unnecessary. Clearly this may not be the case. The behaviour practiced in built up areas should also be observed anywhere where cattle are likely to be grazing if the ongoing increase in Neospora infection in cattle and subsequent loss of calves is to be arrested.